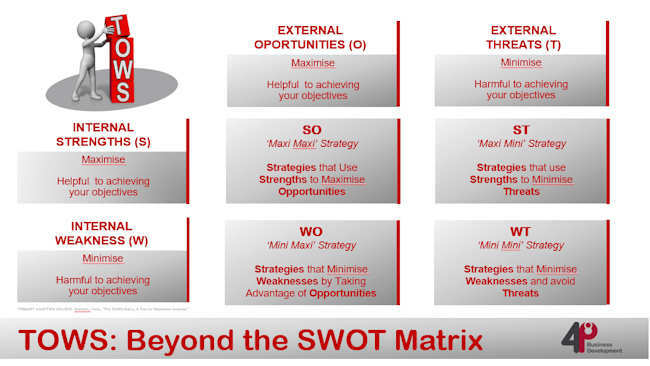 So many business owners believe that they understand what a SWOT analysis is and place little value on it. Perhaps that is because they may have omitted to carry out an in-depth analysis, but more likely, they have never realised the positive return on the time invested because they have never converted it to a TOWS matrix. Like so many business models, a SWOT analysis is an absolute waste of time completing just for the sake of it. There has to be a strategic outcome that you can apply to your business in order to reap the benefits. So what exactly is a TOWS Matrix then? Well, it’s where we take the results of a SWOT analysis and turn them on their head, translating into a working document and business plan. Often, a criticism of a SWOT analysis is that it doesn’t show the relationships between the different factors. As an example, a specific threat might show a weakness as much more significant. Whereas a TOWS analysis will look to match internal and external factors to help identify strategic ideas an organisation could pursue. It helps you to see how it can take advantage of opportunities, reduce threats, overcome weaknesses and exploit any strengths. Once you’ve listed your ideas in each inner quadrant, evaluate the options you’ve generated and identify the ones that give the greatest benefit and best achieve your goals. Strengths and Opportunities (SO) – How can you use strengths to take advantage of opportunities? Strengths and Threats (ST) – How can you benefit from strengths to avoid threats? Weaknesses and Opportunities (WO) – How can you use opportunities to overcome weaknesses? Weaknesses and Threats (WT) – How can you minimise weaknesses and avoid threats? Evaluate any options you’ve generated and identify any that give your business the greatest benefit, and that will best achieve the mission and vision of your organisation. Add these to the other strategic options that you’re considering. For assistance with either TOWS or SWOT, and in creating the perfect plan for your business, do call me on 01280 700405 or click here to send me an email enquiry and let’s see how I can help you. PESTLE Analysis can help minimise risks, eliminate threats and maximise opportunities! Do you have a business plan? Have you carried out the general assessments in order to understand exactly where your business sits in the market? Do you know what risks from external factors may affect you and your business? PESTLE Analysis is a framework used to scan your organisation’s external macro-environment. So many people start a business because it’s something they are really good at, or the products are ones they particularly like, frequently without any strategy or planning. Probably, they have not even thought about the market and if there is a place for them in it. Take the time to conduct a PESTLE Analysis as it gives a bird’s eye view of the whole environment from many different angles that you should keep track of while contemplating on specific ideas, plans and strategies. What is the political situation of the country and how might it affect my business? 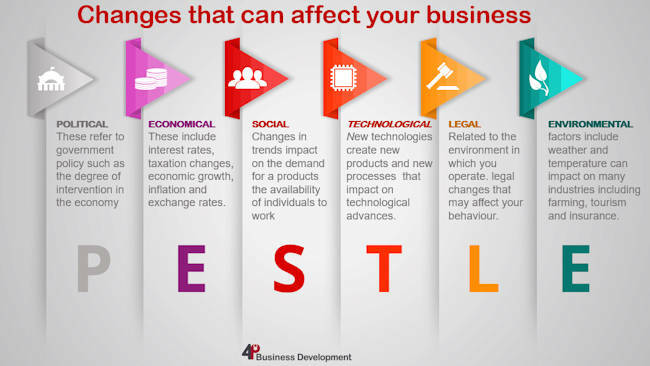 What are the prevalent economic factors and situation may affect my business? How much impact does culture have in the market and how may that affect my business? Are there any current legislations that regulate the industry or can there be any change in the legislations for the sector that I am working in? What are the environmental concerns for the industry sector? So what next? Ideally, you should be considering all the factors from both the view of threats to your business, and also from the view of opportunities that may be open for you to realise greater potential. Once you have completed the PESTLE Analysis matrix, then it’s time to begin to use the information gathered, understanding the potential threats to the business’ ongoing profitability and to assist in identifying future difficulties you may likely face so that action can be taken to help avoid and eliminate their effects. Similarly, the matrix from a positive viewpoint can enable your business to be aware of opportunities that may become available in the future. Analyse the findings and identify strategic options to minimise threats and maximise opportunities. It is important for you to decide which trends should be monitored on a regular ongoing basis and how best to incorporate this information into your strategic planning. And who is going to be responsible for keeping the PESTLE Analysis up to date? The results of your PESTLE Analysis should feed into a SWOT Analysis as it helps to determine the threats and opportunities represented by macro-environment forces that the organisation usually cannot control. If you’d like to talk to me about PESTLE Analysis, coaching for you and your business or need someone to ask those bloody difficult questions then do get in touch. Call me on 01280 700405 or click here to send over an email enquiry and let’s see how I can help you. To become more productive, you need to eliminate time wasting activities! Are you the business owner that is continuously in crisis mode? Do you spend much of you time firefighting? Are you juggling all the balls in the air and find it difficult to delegate? Do you check your email so often that it’s preventing you from getting any actual work done? Then you’re confusing the urgent with the important. Continue in this mode, and you will ultimately drain all of your energy and leave you with little to show for it at the end. Nearly every business person experiences distractions and interruptions that get in the way of your work. You don’t have to suffer from the loss of focus anymore. Now is the time to use a model to prioritise your to-do list. 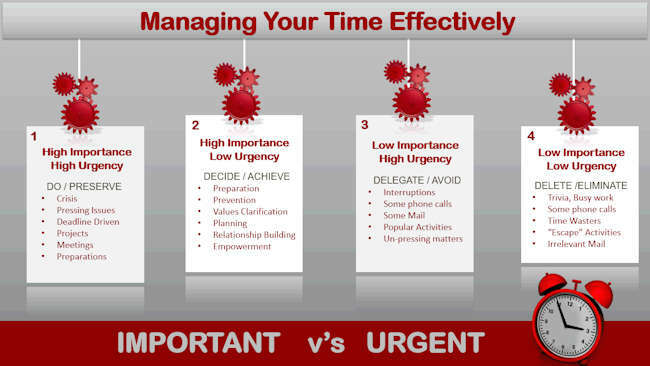 As a business owner, it is paramount that you understand the difference between what is important to you and your business and what is urgent. Take that to-do list and use the model below to evaluate what exactly you should be doing now, and perhaps more importantly, what you should be delegating and what you should be avoiding entirely. As a business owner, you should only be working on the important issues and matters within your business. How many of you are in the 4th list dealing with trivial and irrelevant matters? The easiest way to make sure an important task urgent is to give it a deadline. So the first thing that you have to do if you want to make sure important tasks get done is to set deadlines. So very often, a really important task is more like a project inasmuch as it’s huge and needs a tremendous amount of work. In order for you to set deadlines, you first have to break it down into smaller tasks and set deadlines for each of those. When I listen to business owners telling me that they can do the job better themselves so they will not delegate, I realise immediately that they need my help! In order to work on the business and to make it a success, you need to take a step back. It is paramount that all the tasks in the Low/Important boxes are delegated. Next, you need someone to delegate all the less important task to, and remember, you must keep those people accountable. When it comes to holding other members of your team accountable to deadlines, it’s important to make people realise how important these deadlines are to you. You can’t tolerate missed deadlines. And that means actually checking in and having uncomfortable conversations when deadlines are missed. If you don’t do this, then people will understandably assume that deadlines aren’t that important to you, and they’ll start getting pushed back or missed more and more often. Take control, be more productive and eliminate time wasting activities by using the Eisenhower Box and/or the Important vs Urgent model. these simple decision matrices will help you take action, organise tasks, and get more done. If you’d like some help eliminating time wasting activities which, in turn, makes you more productive, give me a call on 01280 700405 or click here to send me an email enquiry and I’ll ask you some bloody difficult questions about what’s holding you back.